Stanley Osher, UCLA professor of mathematics and former director of applied mathematics, has been awarded the William Benter Prize in Applied Mathematics 2016 by City University of Hong Kong (CityU) for his significant contributions to applying mathematics to solving real-world problems. 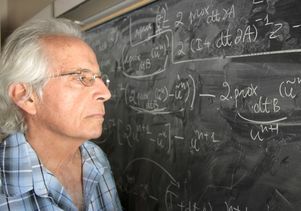 Osher's research in areas such as high-resolution numerical schemes for shock capturing has been highly influential in computational mechanics. He has created pioneering algorithms for image processing and his work on capturing moving interfaces using implicit representation has brought about breakthroughs in movie animation. The prize was presented to him by Professor Roderick Wong Sue-cheun, director of CityU’s Liu Bie Ju Centre for Mathematical Sciences during the May 30 opening ceremony for the International Conference on Applied Mathematics 2016. “Professor Osher has made profound progress on bridging the gap between mathematics and application through his fundamental contributions to developing mathematical methods and efficient algorithms,” Wong said. A UCLA professor since 1977, Osher has collaborated with colleagues in a wide range of fields, and the mathematical techniques he has pioneered have been highly influential. His research findings have contributed to improvements in MRI scans and medical image analysis, have advanced computer chip design, helped law enforcement agencies combat crime, enhanced computer vision, provided new ways to forecast weather and identify the source of earthquakes and even revolutionized computer modeling for the design of supersonic jets. He was among the top 1 percent of the most frequently cited scholars in both mathematics and computer science between 2002 and 2012. His research was the subject of three-day “Osher Fests” at UCLA in 2002 and 2012. Osher has created innovative numerical methods to solve partial differential equations, and analyzed algorithms and their underlying partial differential equations. He also produced a new method for accurately describing how objects change shapes — predicting how, for example, a drop of oil floating in water will morph based on currents in the water, including what would happen if the drop of oil divided in two or merged with another drop of oil. The recipient of numerous awards, Osher was elected in 2005 to the National Academy of Sciences and in 2009 to the American Academy of Arts and Sciences. He has been an Alfred P. Sloan Fellow and a Fulbright Fellow, a fellow of the American Mathematical Society and the Society of Industrial and Applied Mathematics, and was selected to give a plenary address at the 2010 International Conference of Mathematicians and the John von Neumann Lecture at the 2013 meeting of the Society for Industrial and Applied Mathematics. 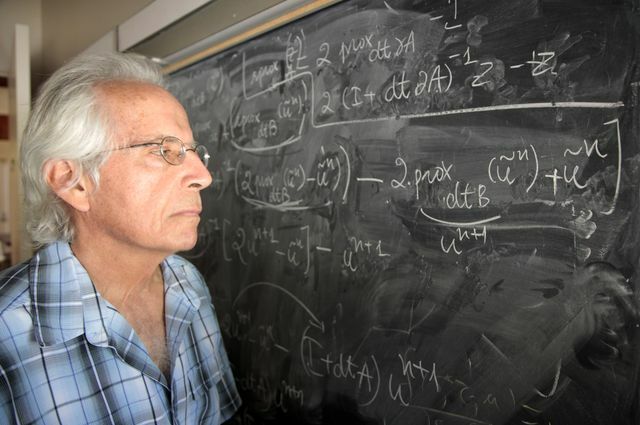 In 2014, he received the Gauss Prize, the highest honor in applied mathematics. Stanley Osher, UCLA professor of mathematics and former director of applied mathematics.